Melbourne's never been short of good falafel in the years I've lived here. Just Falafs is of the same crop as Tahina and Very Good Falafel, a casual little spot with counter service and lots of takeaway orders, serving an array of beautiful vegetable dishes and a couple of nice pickles to back up their specialty falafel. It's all vegetarian here, and mostly actually vegan (including their entire salad range), but it's not a big part of how they market themselves. Across two plates, we sampled widely from the menu. The haloumi plate (pictured top, $15) has just two batons of golden cheese, but plenty else besides: four enormous falafel balls, a mountain of room temperature fried cauliflower, pickled cucumber and cabbage, a swish of hummus and a drizzle of tahini sauce. It's a rich feast. The mixed salad plate ($13 + $4 for four falafels) made an excellent companion dish. The veges in rotation on our visit were charred broccoli with chilli and garlic, beetroot and carrots in fig balsamic, roast pumpkin with caramelised onion, tahini and pomegranate, roast cauliflower with capers and almonds, and Jerusalem grains. It's all varied and filling and very, very tasty. So much so that we haven't been tempted yet to order Just Falafs' rosemary and garlic chips! It's evident that many Fitzroy locals have made Just Falafs their go-to for a no-fuss, nourishing dinner. The same rotation of dishes is available eat-in and takeaway, on a plate or wrapped into pita, with family packs designed for dinner at home or a picnic down at Edinburgh Gardens. We were able to grab a takeaway box and hold away some of our own leftovers for lunch the next day too. I reckon it'll be a winner, any way you order it. Just Falafs has also received praise on Fitzroyalty and Laura Moseley. Accessibility: Just Falafs has a shallow ramp on entry. Furniture is crowded together; there's a bench down one wall and the rest of the seating is backless stools. There's a reasonably clear walkway through the middle. We ordered and paid at a low counter. There aren't toilets on site, and on a previous visit I was directed to use the facilities at the bar next door. Regular readers will be well aware of our long-standing love for Ottolenghi's vego recipes. The usual downside of a Yotam dinner is his over-complicated approach, so we pounced on this week's Guardian column, which promised "smart tricks to simplify your cooking." This orecchiette recipe really lived up to the promise - it's a super simple one-pot recipe that you can throw together in about half an hour. And it delivers that famous Ottolenghi flavour! The olives and capers do a lot of the heavy lifting, so it's a strong and salty flavour, but the sweetness of the cooked down tomatoes smooths things out a bit. I was completely smitten by this, and I'm already thinking about making it again. Combine the garlic, chickpeas, paprika, cumin, tomato paste and olive oil in a large saucepan and sautee for 5-8 minutes. You're trying to get a bit of a crisp onto the chickpeas if you can. Combine the parsley, lemon zest, capers and olives in a bowl. Add about two-thirds of this mix to your saucepan along with the cherry tomatoes, caster sugar and caraway seeds. Cook for another couple of minutes, stirring regularly. Add the pasta, stock and another 200ml of water and bring the mix to a simmer. Cover and cook for 12-14 minutes, until the pasta is ready to eat. Stir in the the leftover parsley mix, drizzle with a couple more teaspoons of olive oil and serve. After a gloriously sunny autumn, Melbourne finally turned on some cold weather on the weekend and gave us a good excuse to cook up some wintery comfort food. We dug out Street Vegan and tweaked one of their sandwich recipes into something we could serve with veggie box salad. There are a heap of interesting takes on tempeh and seitan in the book, but it was this bourban-glazed seitan that caught my eye. It's a fairly involved recipe - you've got to make seitan first (we used our new favourite recipe), marinate it and then slow-cook the onions and fry up the seitan. I was a bit over it by the end, but it was just about worth the effort - the glazed seitan in particular is outstanding, with a sweet and smoky richness that's pretty hard to top. The onions were good, but maybe not good enough to justify the effort involved - a long, low fry-up with a splash of liquid smoke would probably work almost as well. The original recipe has a complicated aioli as well, but we just stirred some lime juice and chipotle pepper into some mayo and dressed our salad in it. Bring 1.5 cups water to the boil in a small saucepan. Add the tea leaves, turn off the heat, and cover the saucepan. Let the tea steep and cool for 20 minutes. Strain your tea into a blender and add the olive oil, tamari, oregano, paprika and mustard. Blend on high speed for a minute or so, until it's emulsified. Place the onions cut side down onto a baking tray. Pour the marinade over the onions and bake for an hour or so, until the marinade has basically disappeared. Our oven might not have been hot enough, so the marinade didn't really disappear even after 80 minutes. Slice the onions into thin strips. If you want them softer and have some marinade left you can do what we did and fry the onion over high heat for another 10 minutes or so, cooking the marinade off completely. Onto the seitan! Heat 2 tablespoons of olive oil over medium heat. Throw in the sliced onion and stir-fry for five minutes or so until the onions are cooked through. Throw in the chilli flakes, raisins, thyme and brown sugar. Cook, stirring for 2 minutes until the sugar dissolves. Stir in the bourbon, miso, rice vinegar and two cups of water. Bring to the boil and then turn off the heat, stick a lid on it and leave it to cool for 20 minutes. Once it's cooled off enough, blend the marinade into a thick liquid. Heat the remaining olive oil over high heat in a cast iron frying pan. Throw in the seitan and fry, stirring frequently, until it browns up nicely. Pour over the marinade and cook it off - it should take another five minutes or so, caremelising nicely. Serve the seitan, topped with the onions and with a salad and some tangy mayo alongside. 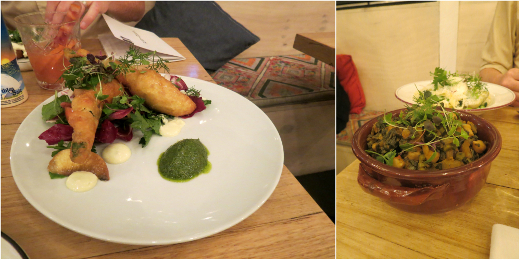 We snuck into Small Axe Kitchen early on Friday night, keen to find out if their dinner menu's as lovely as their daytime offerings. The menu runs a lot longer than I anticipated, in traditional Italian courses of antipasti, primi, secondi, contorni, and dolci. Vegetarian, vegan and gluten-free dishes are well labelled; vegos are best catered to in the antipasti and contorni, while the gluten-free stuff is concentrated in the meaty secondi and the more veg-friendly contorni. Once we'd ordered, they set us up with some light bread and fruity olive oil. 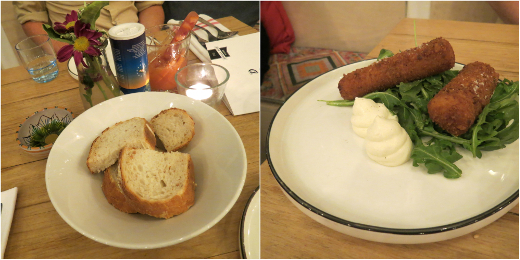 Potato croquettes ($4 each) arrived soon after, perfectly squidgy batons, with a dab of parmesan mousse and just enough rocket to counteract the richness. Battered zucchini flowers ($22) looked almost like battered fish, stuffed with herbed ricotta - we expect they'll soon fall out of season. The accompanying salad was bright and slightly bitter, with radicchio, nectarine wedges and pickled radish rounds. Our side of braised silverbeet, black kale and chickpeas ($12) was a much heartier entree to the cold weather ahead. Our favourite was the plate of fresh, housemade fettucine ($20), served with peas, broad beans, artichoke hearts, mint, mascarpone and ricotta. Splitting it was clumsy work but we both fought for our fair share. For dessert, we shared a tart and tangy medley of grapefruit slices, mandarin jelly cubes and mandarin granita scattered with almond crumble ($16). It wasn't too outlandish to enjoy a hot chocolate ($4) on the side. At dinner, Small Axe Kitchen offers almost everything we've loved there at breakfast - clear and appetising veg options that balance fresh produce with fancy touches, served by friendly and helpful staff. The only loss, for now, is that it's not so much fun to sit outside! 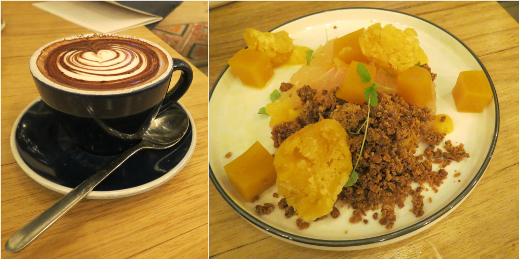 You can also read about one, two of our visits to Small Axe Kitchen for breakfast. Accessibility: There's a small step on entry. Tables are densely packed with a clear corridor through the middle. Tables outside have small backless stools, high benches in the front room have tall backless stools, and tables in the back room have ordinary backed chairs. We ordered at our table and paid at a low counter. We didn't visit the toilets. Late last year a friend of mine gave me a small can of sweetened chestnut spread, after they'd been travelling in France. I had little idea what to do with it, but I had a hunch that Ottolenghi would have a suitable recipe or two. Sure enough, chestnut spread turns up in the index of Sweet as an ingredient in two desserts. The Mont Blanc tart is reinterpretation of an Italian dessert where chestnuts are sweetened and whipped into cream. Goh and Ottolenghi's version starts with a sweet shortcrust; it's lined with a thin layer of dark chocolate and then filled with the chestnut spread. The name then comes in with a tower of whipped cream, which is sprinkled with candied pecans. The presentation of my version didn't fulfill that vision, though it was pretty enough. Instead of baking individual tart shells I formed a single large pie. The double cream I bought became thicker and denser with whipping, lacking the airy texture needed to form a white mountain. On its own, the chestnut spread had the nuttiness and velvety texture of hummus, though it was a lot sweeter. In the dessert, it acted as an unassuming caramel filling - the cream was richer, the chocolate had more depth, the pecans were sweeter. Together they formed a fancy and tasty dessert, even if the chestnut centre was overshadowed. For me it was a successful one-off project that I was proud to share around Ottolenghi club - I don't foresee any more little cans of chestnut spread coming my way, and this project hasn't inspired me to order them online. Start with the pastry. Drop the flour into a large food processor, dice the butter and drop it in after the flour. Add the sugar and salt. Pulse the ingredient together until they resemble coarse breadcrumbs. Add the vinegar and water, and pulse further until the dough just starts coming together. Turn the dough onto plastic wrap, forming it into a ball the then flattening it into a disc. Refrigerate the dough for at least 1 hour. This is plenty of time to candy the pecans. Preheat an oven to 190°C. Line a large baking tray with paper. Place the maple syrup, glucose and sugar in a small saucepan and set it over low heat. Stir them together until they're combined and smooth, then add the pecans and salt. Turn off the heat and stir the pecans until they're evenly coated in the syrup, then turn them into the baking tray, spacing them out so that they're minimally touching. Bake the nuts for 8 minutes, until the syrup is bubbling and they smell toasty. Allow the nuts to cool to room temperature, then roughly chop them. When the dough is ready, roll it out between two sheets of plastic wrap and fit it into a greased pie dish. The dough will contract when baked, so leave plenty of extra pastry on the edges. Refrigerate the pastry shell for 30 minutes. Preheat an oven to 180°C. Retrieve the pastry shell, prick its base with a fork, line it with paper, and pour in some pie weights (I have some old dried chickpeas for this job). Bake the pastry shell for 18 minutes, until it is golden brown around the edges. Remove the paper and pie weights, then bake for another 8 minutes, until the pastry is cooked through. Allow the base to cool. Gently melt the chocolate using your preferred method, then pour it into the base of the pastry shell, spreading it evenly with the back of a spoon. Refrigerate the pastry to set the chocolate. When the chocolate is set, spoon in the chestnut spread and spread it out evenly. Return the tart to the fridge. When you're almost ready to serve the dessert, place the three cream ingredients in a small bowl and whip them with an electric beater until medium-soft peaks form. Serve slices of the tart topped with white mountains of cream and sprinkle the candies pecans on top. Easter brought with it another meeting of our regular Ottolenghi club. It was typically indulgent, with a baked blue cheesecake, pea and mint croquettes, lentil and asparagus salad and a fancy tart that Cindy will post about soon (photos of the whole shindig are on our facebook page). My contribution was this weird-sounding recipe from Plenty. It's rare that I'll take on a dish that doesn't have a photo in a cookbook, but this seemed like a rare simple dish from ol' Yotam so I decided to give it a shot. Sweet chilli sauce is not the kind of ingredient I imagine Ottolenghi reaching for very often, but it works nicely in this dish with the soy and sesame oil flavours. The real stars are the sprouts though - you've really gotta get them to caramelise for the full effect. The tofu and shitakes added some nice variety and, despite the rather brown visual aspect, this got the Ottolenghi-club tick of approval. Slice the tofu into flat squares, about 4cm wide. Mix together the sweet chilli sauce, tamari, 2 tablespoons of the sesame oil, rice vinegar and maple syrup in a flat container and marinate your squares for an hour or so, flipping them over halfway through. Trim the bases off the sprouts and cut them in thirds longways so you get relatively flat pieces. Heat 4 tablespoons of the sunflower oil in a frying pan over high heat. Throw in half the sprouts and a few shakes of salt and cook on high for a few minutes. You want to get them nice and charred - almost to the point of burning them - so don't stir too much. Repeat with the other half of the sprouts and set them aside in a bowl. Add another couple of tablespoons of sunflower oil to the pan and stir fry the spring onions, mushrooms and chilli flakes for a few minutes. Pop them in with the sprouts once you're done. Now fry the tofu squares - pop them flat in the pan for a couple of minutes on each side, until they're nicely caramelised (you might need to do a couple of batches and top up the oil). Once the tofu is cooked, kill the heat and stir the sprouts, mushrooms etc in with all the tofu.. Pour in the leftover marinade and stir through half the coriander leaves and remaining sesame oil. Serve warm, garnished with the rest of the coriander and the sesame seeds. I've tentatively joined a new cooking club! This one aims to select a different cookbook for each potluck gathering. Yet the first feature was Ottolenghi & Tamimi's Jerusalem. It's not a stretch from my other club's driving theme, and I borrowed the book from a generous Ottolenghi clubmate. I also stuck to my well-worn dessert-making groove. Jerusalem has a couple of fabulous-looking orange cakes that would likely travel well, but I ultimately preferred to try my hand at the sweet filo cigars. They're stuffed with sweetened ground pistachios and almonds, fried, and then dipped in honey. I got an excellent head start the night before, preparing the nut filling as my dinner baked and wrapping it in filo in front of Netflix. Things went awry and I really started swearing at fry-time later that evening: the cigars' stubborn, asymmetric centre of mass meant that they wouldn't turn over in the oil; one or two even burst their filling. The next morning, I felt a bit calmer and the job at hand felt more feasible. All except the first three cigars were nicely browned, not too greasy, and their weirder edges softened in their honey dunking. With an egg and lots of honey involved, this recipe is far from vegan. I reckon conversion wouldn't be too difficult, though - I'd try skipping the egg entirely, perhaps adding a dot of margarine or olive oil to the filling and sealing the cigars with water. Honey could be replaced with diluted agave nectar, or a heavy sugar syrup with a drop of orange blossom water. These cigars were the short, sweet end that our sprawling lunch needed. They're more filo than filling yet the ground nuts, brightened with lemon zest, shine through. I used orange blossom honey, and we could also discern its floral scent. The overall effect is soft, layered and very, very sugary. Delightful as they were, this is probably just a one-off recipe for me. I live so close to Sydney Rd, where similar Lebanese pastries are cheap, abundant, and fried by someone else. Instead I'll save my filo folding for bougatsa me krema. Blend together the flaked almonds and 60g of the pistachios in a food processor, to form a coarse powder. Tip the ground nuts into a small-medium saucepan, add the sugar and 4 tablespoons of water. Set them over low heat and cook for about 4 minutes, until the sugar is dissolved. Turn off the heat and allow the mixture to cool a little. Separate the egg. When the nut mixture is just lukewarm, whisk in the vanilla, egg yolk, and lemon zest. Unravel the filo pastry and use just one sheet at a time. Drop a generous tablespoon about 2 cm away from a short side. Fold one long side up to cover it, then the closest short side, then the other long side; roll up the filling to form a cigar shape, sealing the egg with a little brush of egg white. Repeat with the rest of the filling, making a dozen or so cigars in total. Pour the peanut oil in a medium saucepan to about 2cm depth. Bring it to medium heat. Fry the cigars on two sides, in batches, until they're golden on both sides. (The original recipe thinks this will take 10 seconds per side, but it was double that for me.) Cool the cigars on absorbent paper. Place the honey in a small saucepan with 1 tablespoon of water. Set it over medium heat, stirring together the honey and water until they're well mixed. Turn off the heat and drop 2-3 of the cigars into the saucepan, turning them to coat them in the honey and letting them sit for just a minute each. Pull them out and place them on a serving dish or in an airtight container. To serve, roughly chop the remaining pistachios and sprinkle them over the cigars.